Learn about soils and how to improve the soil quality. Soil is the foundation for profitable farming. There are many things that can be wrong with soil (eg. poor nutrition, chemical imbalance, structural problems such as drainage, lack of microbial life). Often minor and relatively inexpensive treatments can make a huge difference to productivity, but the problems need to be identified first, and that requires a solid understanding of soil theory and management practice. Develop a broad understanding of the physical and chemical properties of soils. Develop strong understanding of soil science and its impact on plant growth. Understand the principles, methods and techniques of sustainable soils management. Understand the principles and practices of earthworks. Understand causes and remediation methods of land degradation and soil problems. Develop a broad knowledge in the use of growing containers for agriculture. Develop practical knowledge about managing soil for particular cropping uses. Soils can vary a great deal over a small area, even on a single farm. Often the soils on a slope or on top of a small hill can be very different to soil in a valley or gully. These variations can be both in physical characteristics and in the soil chemistry. Some soils can be even textured, and others may not be so even. Some absorb and hold moisture better than others. Some contain a lot of nutrients, and others do not. These and so many other factors need to be understood by a farmer if the farm soils are to be managed effectively and farm production optimised. This course will allow your to undersatand such things, and develop the depth and breadth of your knowledge and capability to manage different parts of a property appropriately, according to soil variations across the property. Soils in this group have low runoff potential when thoroughly wet. Water is transmitted freely through the soil. They are usually deep soils, but if shallow often overlie a substrate which is semi-permeable to water. 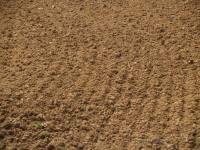 The uniform coarse-textured soils are free-draining soils with a poor capacity to hold water and nutrients. They are usually deep, with the soil profile often extending to more than 2m. Following rain the wetting front gradually moves through the soil profile. These soils do not reach relatively steady moisture content until 24 to 48 hours after a significant rainfall event, because water continues to drain through the profile. Deep drainage below the root zone can be frequent and extensive. Soil water can drain rapidly below the root zone unless there are actively growing plants. High rates of recharge are expected on highly leached coarse - textured soils with very low water storage and where physical or chemical properties limit root growth. Water entry is rapid unless the surface soil is water repellent. A water repellent surface will result in redistribution of water within the profile and can also cause significant runoff and erosion during summer storms. Low to very low water storage capacity (20 to 80mm/m), which means crops or pastures are subject to moisture stress when rainfall is irregular. These soils are highly susceptible to wind erosion as most uniform coarse-textured soils have a loose, single grain surface. Maintaining an adequate ground cover is a priority at all times. Water erosion is generally minor because there is minimal runoff unless the soils are water repellent. Nutrient pollution of groundwater, especially with P, is a major concern as the nutrients may contribute to eutrophication of rivers, estuaries or wetlands. Suitable crops or pasture species should have a deep root system to take advantage of the large volume of soil and to minimise moisture stress and deep drainage. These soils are not suitable for crops with stubble that is easily detached and removed by wind, leaving the soil surface bare. hydrology,infiltration, water storage and environmental factors will be different. You need to understand that -and so much more. This course is an excellent way for you to develop that understanding.